Unfortunately Thomas is currently sick with croup. He’s doing pretty well, but is definitely more tired than usual. Thomas has been having a really great week. On Wednesday he told Erik “Happy Birthday to Daddy,” counted to 10 and then back down to 1, and stopped working on a puzzle by himself to go join a group of classmates singing “Row, Row, Row your boat” without prompting. Tonight he talked on the phone with my sister, saying “Hello Auntie, Bye.” He’s also started playing with hand puppets at school and home which is a great use of imagination and interactive play and he’s taking his little Super Grover toy and flying him around the apartment. I attended my first professional conference as a full-time archivist this weekend. It was a two day event at UConn in Storrs last Friday and Saturday. Erik and Thomas came down with me and we had a nice night out although it would have been better if the hotel pool had better hours so Thomas could have gone swimming. I greatly enjoyed the conference, especially since it was geared towards college and university archives. And I am increasing glad that I work at Tufts–it was pretty obvious that my boss is part of the inner group of NEA and well poised for leadership. In fact, she is co-chairing next fall’s conference which is going to be held at Simmons. I’m really looking forward to helping with that –in June, after I graduate. If you are not of the belief that the Beatles are the greatest and most important band in the history of rock and roll, then you are wrong. 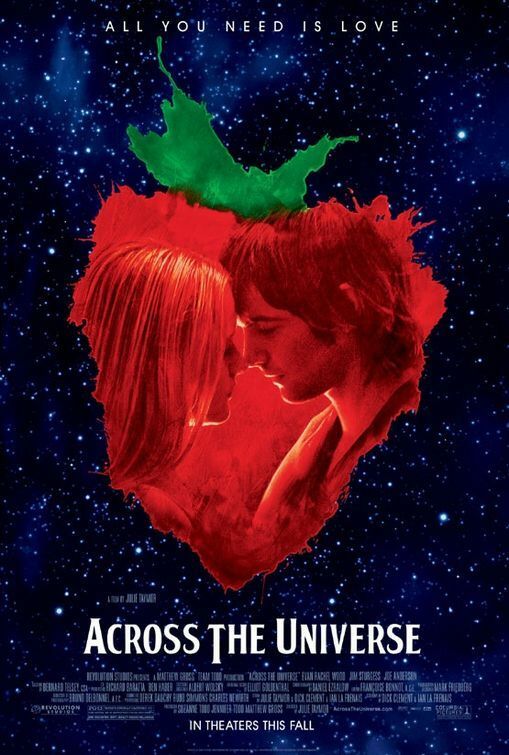 In Across the Universe we have 30 of their songs on display, come to life in a movie of astounding courage, visual inventiveness and the firm belief that all you need is love. That we can do it without making use of their best song (“Help”), their most beautiful song (“Here Comes the Sun”), their most poetic (“Eleanor Rigby”) or any of the songs written for their own first shot at the movies (“A Hard Day’s Night”) makes you understand the depth and breadth of the music they gave us in just eight years. In the last several years at the movies, I have had my heart shattered (In America), my vision realized on screen (Lord of the Rings), my comic books come to life brilliantly (Batman Begins, X2) and disastrously (Daredevil, Fantastic Four) and my belief that love will win over all first reaffirmed (Elizabethtown), then shattered (Brokeback Mountain). This is the first film, that from the first minute, I absolutely wish I had written. This is not, as Jude would have us believe in the first few lines, the story “all about the girl who came to stay.” In some ways, this is not even the story of Jude, the shipdock welder from Liverpool at loose in 1968 Greenwich Village. This is the story of the sixties, of the Beatles, of today. There is a story, of course, a love story of Jude, dancing in a leather jacket in a Liverpool club that looks, not too surprisingly like the Cavern Club and how he comes to America and falls in love with Lucy, the clean cut American girl dancing at the prom with the boyfriend soon to be off to Vietnam. Their connection is her brother Max, and while at one point, he does have a silver hammer, he, at least, does not actually use it to kill anyone. The songs are not just on dazzling display, but also sung anew, both by young actors, and veteran singers (and let’s just say here, that I have been right for years in my claim that Bono and Robin Williams look alike). And these new voices don’t just provide words, they give us a different look at these songs. Is “I Wanna Hold Your Hand” a happy little love song or a reminder of what you can’t have? Is “All You Need is Love” an anthem or a plea? Is “I am the Walrus” a drug trip or a different viewpoint on life. The answer to the last question is, probably both. Who knows what reaction you will have to this film. What it made me do is go home, crank up the volume on every Beatles song ever recorded and remember that all you need is love. All you need is love. Love is all you need. We went apple picking on Saturday. We had a lovely time. It was a good thing we went on Saturday, because Sunday and Monday were both very cold and rainy. Unfortunately our digital camera isn’t charged and we don’t know where the charger is, so all our pictures are on a disposable camera. Once we get them developed I’ll have a disk made and post a few of them. Thomas also enjoyed the hay ride we took and the hay bale maze.